RISULTATI 37° CAMPIONATI ITALIANO ASSOLUTO DI PL - UOMINI CAT. -120 , +120 KG. INSERITI RISULTATI 37° CAMPIONATI ITALIANO ASSOLUTO DI PL - UOMINI CAT. - 120, +120 KG. RISULTATI 37° CAMPIONATI ITALIANO ASSOLUTO DI PL - UOMINI CAT. -105 KG. RISULTATI 37° CAMPIONATO ITALIANO ASSOLUTO DI POWERLIFTING - DONNE CAT. 63 , -72 , -84 , +84 KG. INSERITI RISULTATI 37° CAMPIONATI ITALIANO ASSOLUTO DI PL - DONNE CAT. -63, -72, -84, +84 KG. RISULTATI 37° CAMPIONATI ITALIANO ASSOLUTO DI PL - UOMINI CAT. -93 KG. RISULTATI 37° CAMPIONATI ITALIANO ASSOLUTO DI PL - UOMINI CAT. -83 KG. INSERITI RISULTATI 37° CAMPIONATI ITALIANO ASSOLUTO DI PL - UOMINI CAT. - 83 KG. RISULTATI 37° CAMPIONATO ITALIANO ASSOLUTO DI POWERLIFTING - DONNE CAT. - 57 KG. RISULTATI 37° CAMPIONATI ITALIANO ASSOLUTO DI PL - DONNE CAT. -47, -52 KG. INSERITI I RISULTATI 37° CAMPIONATI ITALIANO ASSOLUTO DI PL - DONNE CAT. -47, -52 KG. 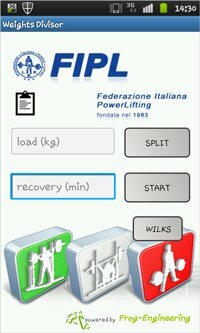 RISULTATI 37° CAMPIONATO ITALIANO ASSOLUTO DI POWERLIFTING - UOMINI CAT. - 74 KG. INSERITI RISULTATI 37° CAMPIONATI ITALIANO ASSOLUTO DI PL - UOMINI CAT. - 74 KG. RISULTATI 37° CAMPIONATI ITALIANO ASSOLUTO DI PL - UOMINI CAT. -59, -66 KG. INSERITI RISULTATI 37° CAMPIONATI ITALIANO ASSOLUTO DI PL - UOMINI CAT. -59, -66 KG.